When LEDs arrived on the scene in the late 1990’s, I caught a glimmer of what was to come. 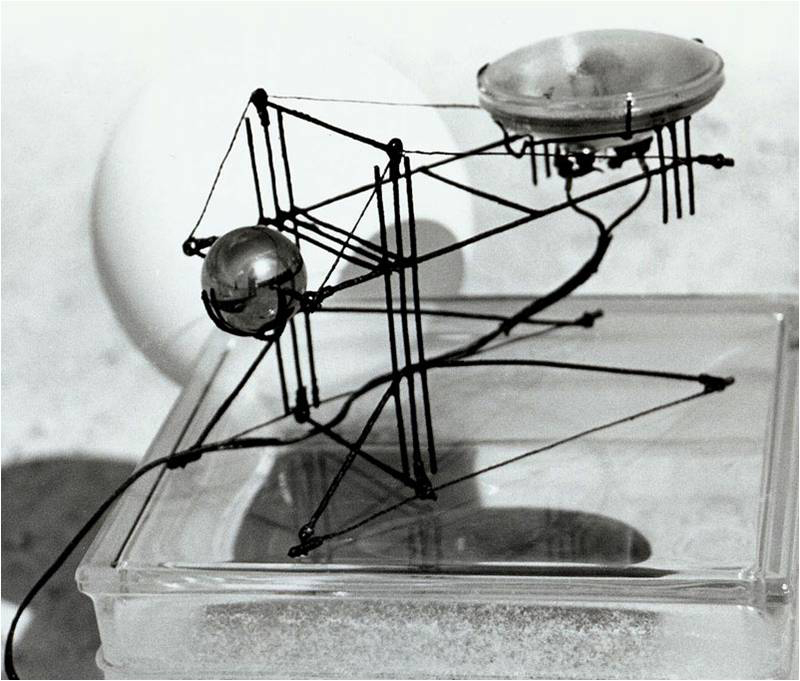 By the year 2002, it was obvious that solid-state would be delivering something new, and that the properties of the source technology shared a great deal with the halogen lamp from a lighting perspective, with a huge advantage – far less heat, much tougher and resistant to impact, and very long lived. The only issue was, color quality was initially poor, consistency from LED to LED was awful, and light output per individual LED device was pathetic. This required designs utilize a number of LEDs mounted to circuit boards, wired to drivers that were clumsy at best. The complexity of LEDs in the earlier stages were compounded by the lack of available components, which meant one-off application of the technology was out of reach for anyone not up for custom electronics design. This “Ratchet” fixture was my first attempt at an LED sculpture design. The “Ratchet” fixture reflected the issues of the day when attempting to incorporate LEDs with enough light output to be considered useful. The head utilized a custom circuit board with an array of 12 Nichia LEDs, split into two circuits for hi-lo setting. These were mounted to a machined heat sink. This experiment marks a transition I made from halogen to LED. I have not made another halogen sourced product since. While the light output was lower than I wanted, it was good enough. The color was also acceptable (80CRI), and while the efficiency was pretty pathetic by today’s standards (36lm/W), it was better than halogen by a factor of 2, leaving the fixture head far cooler than it would have been had it been lamped with its originally contemplated 20W halogen source. The issue I had at the time was to complete this product I required assistance, as I had no resources to gather the LEDs and circuit boards at the time. For this, I enlisted the help of Don Brandt, who was working with me as an engineer. 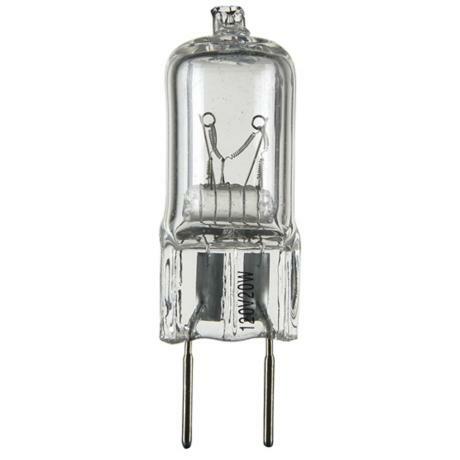 For the exposed guts driver, I simply cut the cover off two Xitanium drivers and inserted them in a clear acrylic tube, with machined top and bottom cap to mount them to the fixture body. 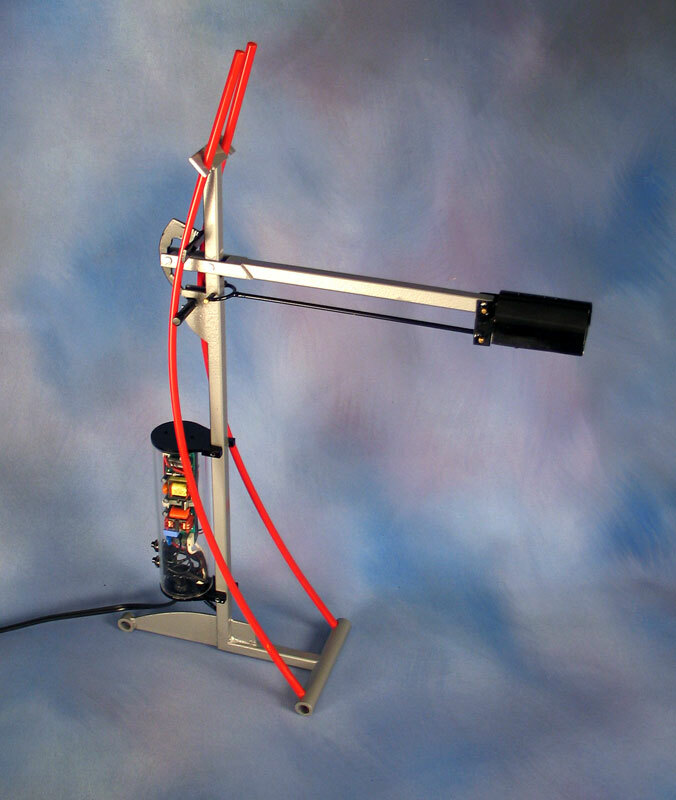 Not long after creating the ratchet light, I came across several LED source products that held promise for the future. The first was, of course, the K2 LED mounted to a star board. This did okay for low light requirements, but the package size meant that anything that required higher outputs simply took up too much real estate. The first really attractive package to me was the Lamina BL3000. 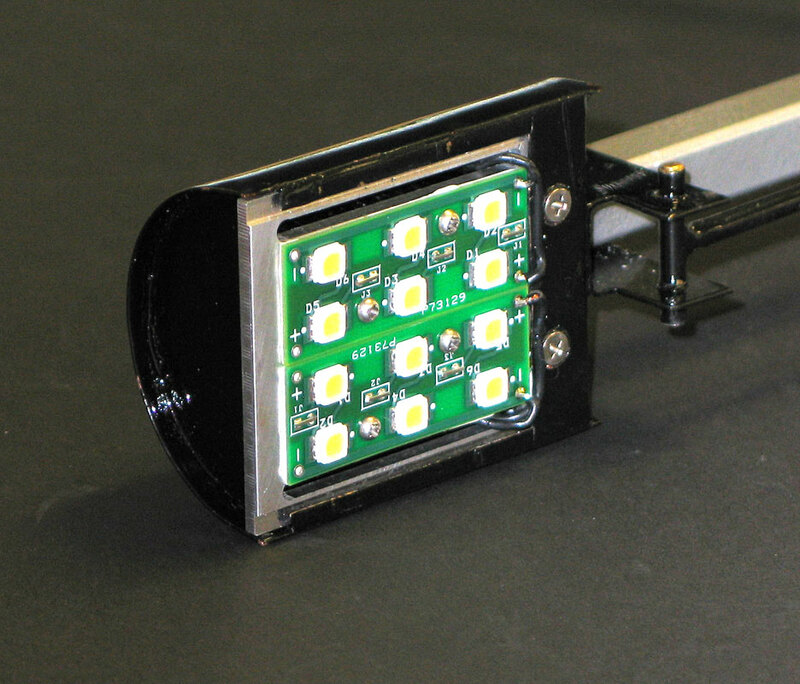 This delivered 400 to 600 lumens, required only two soldered connections and a heat sink, and delivered better efficacy to lower heat even more than custom arrays used before. The Titan delivered more light and efficacy, but also produced multiple shadows, and used a bulky connector that never fit my needs well. This later was replaced by the Titan device, which offered greater focus, but for me, also delivered multiple shadows from having fewer LEDs surrounded by the small optic cups. The connector was also bulky and required too many lead-in wires, so actually was a product improvement that turned me off the Lamina in the end. While I still used a few of the round board Atlas single pot products, which were good light producers, the BL3000’s short market life was a real disappointment – and a sign of what would be life in SSL, product obscelesence cycles that were shorter than light fixture product development cycles – but that’s another issue addressed elsewhere. Suffice it to say that the elimination of the BL3000, rather than evolve it, ended my interest in Lamina. Oddly enough, the concept of the BL3000 was the foundation for what became the COB array – which brings us to the pioneers of the fried egg LED package. 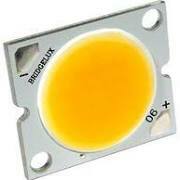 When I first saw the Bridgelux COB array, I knew the halogen lamp was indeed history. Here, in a single package, was a simple wire connection, compact lumen source, excellent thermal characteristics, high efficacy, and very attractive light qualities. No multiple shadows, one homogeneous light source with a smooth light pattern. It was also available initially in voltages that fit very well within power supplies I was already working with, between 12V and 24V DC, so use of compact little drivers from Recom and LED Dynamics fit perfectly. The Bridgelux ES array has been my LED of choice for a wide range of uses. It simply works. In just a few short years, I have used the ES LED array in sculptures, decorative designs, focused optic designs, downlights, accent lights, and photography lights. With a little familiarization, these devices deliver 90% of what made the halogen lamp such a go-to source, but with significantly less power, excellent thermal performance, solid reliability, and simple as nails to use. Efficacy has improved over the years, from the mod 50’s to now over 100lm/W. Further the product line now includes arrays delivering over 10,000 lumens, which expands the range of applications dramatically. My Tasca product line uses this LED as its core, delivering over 800 lumens at only 12W. With the simplicity of two solder points, I can offer a rebuild-able product that will last decades, rather than using integrated LEDs that create a throw-away product. When I use them in sculptural fixtures, where the life of the LED is well beyond the fixture itself, I can use thermal epoxy and integrate the LED directly into designs, and now worry about re-lamping, something that was always an issue with halogen sources. This design was my first use of the COB Bridgelux array that became the foundation for many others to come. These types of array are also very versatile. By simply changing drive current, they will deliver as little as 300 lumens, to as much as 2000, from the same LED. Now, with CRI’s of 80, 90, and even 95, the light quality has improved along with the efficiency, all at a cost that has continued to drop every year. My first purchases of these devices ran over $20 per device. Today, they are readily available through distribution at under $7. But, not all is perfect in LED land. COB array designers have been increasing forward voltages with each new version of these products. Where the original designs were available in 12V and 18V variants, these are now gone, replaced with 21V and >30V designs, some as high as 37V. This creates some issues in compact fixture designs, where remote plug-in power supplies and miniature head-mounted drivers are employed. The cost and availability of >36V power supplies, or the low efficiency of boost drivers creates some conflicts that are often hard to get around. More frustrating is that the older lower voltage products were simply dropped, leaving many products already in place without sources. I have several fixtures in service using the original 12V arrays, sold to customers on the promise of future ease of replacement (using Molex LED holders), that are now un-serviceable. This leaves me liability exposed to customers, and a bit frustrated that products can be so cavalierly dumped. As others entered the COB market space, they too went down the higher voltage path, with the range between 30V and 37V most common. 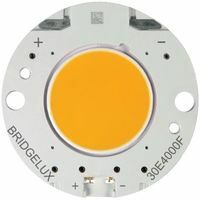 This changed Bridgelux from a unique entity to sharing the same basic volts/current characteristics with Cree, Samsung, Citizen, Sharp, Seoul Semiconductor, LG, and Philips to name just a few. This means that for customers I assist in designing products, when COB arrays are considered, we generally compare the specifications of at least 5 manufacturers to choose which one fits the specification best, often using only one driver specification to support them all. This lack of proprietary differentiation in the commercial market space has been a good thing, as most products there are driven by single package drivers connected to line voltage anyway, where higher output voltages are not an issue. For portable lighting design, compact products, and designs intended to be applied in Emerge Alliance spaces (24VDC architecture) the lower voltage LED array is still more desirable. 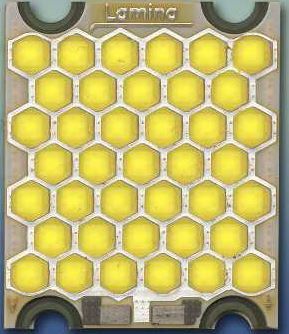 A few years ago, Cree began producing their CXA COB arrays. Originally, these were of too high a voltage to be used in direct competition with Bridgelux, so I rarely considered them. However, as the landscape has settled on the 30V to 40V range, the Bridgelux and Cree products have closer to one another, creating an opportunity to put them against one another in product specifications. In some recent cases, I have employed Cree CXA arrays for other characteristics, like 90/95CRI at 4000K and 5000K, something Bridgelux does not offer. In others, the Bridgelux use of mounting holes for device mounting has won the day. I will say that one advantage Cree comes to the party with, is it’s reluctance to obseletize products. They still offer the XR-C, XP-G and MC-E packages from years back, and don’t indicate any pressing need to toss them, and customers they have using them, aside any time soon. This level of reliable product source is rare in the solid-state universe, as anyone who was left in the dirt when the K-2 LED was pulled from the market with nothing more than a quicky press release. The Vero includes the holder and a connector to eliminate soldering, in addition to thermally isolated solder pads should that be a desired connection. Recently, Bridgelux introduced their Vero product. It’s an integrated holder/array configuration that has some intriguing advantages to it. No more soldering is one big advantage for those squeamish about such things. another is the internal array layout, which is more uniform across the entire light emissions area. This is something the Cree CXA addressed as well, but the Vero takes it a step further still. The range of outputs is also greater than the ES arrays before it, creating greater versatility from fewer shelf items. For some designs, this integrated package may be just the ticket. However, for those considering LED holder or integrated products of this nature, I have one word to consider – Zhaga. Zhaga book 3 specifications define a standardized LED holder platform that will allow numerous sources to be inserted into a single standard format holder. While each holder will be different (for now anyway) to fit individual LEDs, the platform hole spacing, optical center/opening, etc. is standardized. It seems a little odd that the Vero does not fit the 35mm hole center, or 50mm outside diameter of the Zhaga standard, as this would have made it an alternative to the use of a Zhaga spec TC Connectivity Z50 holder over a Citizen, Samsung, Philips, or Sharp COB array.Perhaps this will be addressed in future versions. The V series is similar to other COB arrays, but has variants in lower voltages, which is excellent for those using 24VDC architectures or LEDs in arrays of 2 or more. Behind the Vero, is another new offering, the V-series. This series is similar to the Cree CXA in size and lack of screw hole mounting provisions. However, this range offers something close to my heart – lower voltage configurations. The V-series is offered in two variants, the “A” variant is at the ~35V range, while the “B” variant is at the ~19V range, operating at the more typical 350-700mA currents. That’s good news for those looking for the lower voltage option in this style of product. The concern here is whether Bridgelux will continue to support the older ES arrays, now called the BXRA3 series. When asked, I was told they intend to support these products for the foreseeable future. Unfortunately, we were also assured that they would never obseletize a current product configuration, which they did when they changed voltages in the core ES series that makes up the BXRA3 series. I’ll keep my fingers crossed, as I still find the ES style array my favorite. Of all the LEDs that pass through my business, the ES array is the one I have on hand in greatest quantities for building products one-off, creating working prototypes on the fly, and filling in where older technologies are begin replaced. I’d like to see it live a long life and not become another in a too-long list of products disappeared from the market. For anyone who liked designing around halogen lamps, and were fond of their light qualities and compact energy, the range of available COB arrays today is a great alternative and transition to the SSL universe. With the proper consideration given to thermals, and care in selecting power supplies, it takes little to find these devices attractive. There are also several high performing optics available for these devices, delivering beam patterns from 15 degrees to 72 degrees. Further, due to their soft light source characteristic, simple spun metal reflectors and shades work well. I find diffuse white optics an excellent pairing for creating high efficiency, soft edged patterns for flood shaping. While purest optical designers will scoff, and mumble about Etendue with such large sources, I find that architectural and task lighting level products rarely require super-tight beam pattern control. When that is the end goal, there are an emerging number of very high output LED packages with smaller luminous forms to choose from, so this is really outside this discussion. 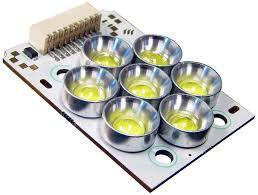 There will never be just one LED form factor, any more than their is one halogen lamp, or one fluorescent lamp. That’s the nature of lighting. In this case, the COB array is one of these, that after several years of experimentation, has become as much a favorite to me as the halogen lamp was fifteen years ago. Word has it that Bridgelux is indeed going to dump the BXRA style arrays (the metal boards with mounting holes) in favor of the V and Vero series products. I’m personally sick of the company saying one day that a product line is stable, then a few months later deciding to kill it off, change it in some manner that requires significant revisions to supporting drivers, holders, etc. I’ve had to deal with customers UL listing blowing up, products I promised customers I could service for 7 years now not having the LEDs available to fulfill that promise, customers who have long development timelines, that find when its finally time to place orders, the products we relied upon have been discontinued. Based on this continual frustration, the companies lack of communication on this issue, I’ve moved on and have been directing new business to Cree, who has a solid track record of stability in their offerings. I’ve also redesigned a customer products to use COB arrays from Lumileds, Nichia, and Citizen, all offering excellent products with aggressive pricing. Without the mounting holes, the V series array is no different than those produced by many others. Further, as the company has increased it voltages on new arrays, the differentiation of mounting holes + 24VDC compatible platform is evaporating, which means their is no reason to consider them exclusively. In fact, Cree has introduced several new COBs in voltages I am looking for, solving that issue, in high CCT / high CRI configurations. If I’m forced to deal with a product that requires an adapter/mounting clip, there is no reason to remain loyal to the producer that’s dumped me under a bus more than once with the continual obsolescence process they said would never happen. We have also come across a couple of custom COB producers who are making some very special products for us to suit unique customer requirements, without having to buy thousands at a time. So, I remain an unrepentant COB user, as I was a halogen user decades ago. I’ve just stopped considering Bridgelux as my primary go-to source on new projects – because I can no longer trust that what I am being told about their product road-map is accurate, or in my and my customers best interests. Seems it changes on a whim at times. This is unfortunate, as I spent many years advocating for the company, as I really liked what they brought to the market. I still believe the product is good, as I have found it to be satisfying in the products I’ve used them in, which are numerous. On the front end, they did more to turn me on to COBs than anyone. Too bad about the back end.